Drive a set of AC or DC chime solenoids using the Pipe Control Computer or as a stand-alone unit. Can be controlled by Classic serial, RS-422, parallel or MIDI sources. This is a special driver board which has 32 MOS-FET outputs, and can be used to connect AC or DC high-power chimes. It replaces unreliable Chimes relay systems and provides up to six volume levels which can be independently adjusted. A rotary switch for volume control would be mounted on the console. The Volume switch is scanned by the CCC in the console, and its position is transmitted to the PCC in the chamber. 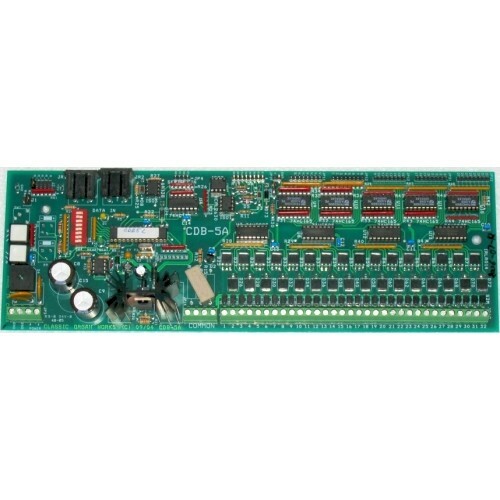 The board would normally be mounted near the Pipe Control Computer (PCC) and connects to it with a 3-wire serial cable (like other driver boards). 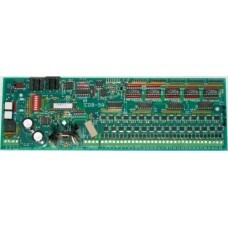 The board requires only a single power source which may be AC or positive DC. An optional RS-422 (3-pair) input circuit can be added, if the board is to be mounted near the Chimes (a long way from the PCC). The board may be driven by MIDI sources on any channel. There are fuses on the board and every output is overload protected. All outputs individually-adjustable for volume. AC drive or DC drive option suits any kind of chimes. Single-voltage power source, AC or DC. Volume control for up to six levels, all adjustable. 32 Parallel inputs, 12V, selectable for active-high or low control. Classic serial or RS422 input (for long distance drive). MIDI input on selectable channel (1-16). Velocity-controlled outputs (by MIDI-control only). Chimes outputs on only when stop is on (prevents inadvertent "dinging"). Power: 10-30V AC or positive DC.